A New Spin on Some Old Favorites - a "Best Book List"
Mr. Wolf hasn't had it easy since the Little Pigs told their story. But what if it was all a misunderstanding? What if the huffing and puffing was just because the wolf had a cold? This whitewashing of the story of the 3 little pigs is bound to appeal to young and old, and is a great example of how we don't always know what's going on as well as we think we do. The whole pea under the mattress thing is soooo last-fairy-tale. Watch princesses compete for the hand of Prince Charming, and how our princess (stumped by the cooking test) improvises a delicious treat all kids love — pizza. But now that she's found her talent, will the princess marry the prince, or open her own pizza place? We know what happened when Goldilocks went exploring in the forest and into a bear's home. But what if it had been the other way around? What kind of mischief would a little bear cub named Somebody get into if he just happened to stroll into the home of Mr, Mrs, and Baby Blair? This is a delightful version of the story that charms most children instantly, as Baby Blair tends to charm most grown ups. What would your average bigfoot find appealing? Dainty feet and fancy dresses? Sweet perfume, perfect manners and flawless grooming? How about a hairy, messy, uncombed and stinky tower of a bigfoot girl? Beauty is in the eye of the beholder, and this Cinderrrrrrella's stepsisters will find they have this prince all wrong. 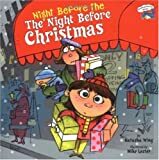 We all know what the night before Christmas is like, but what about the night before that? With tons of last minute details to take care of, mom has a winter cold, and dad is trying but he's just not mom. To top it all, they just realized they forgot to get a tree! Christmas is ruined for sure. Or is it? Discover what Christmas is all about in this somewhat frantic, beautifully illustrated story. It's not as "nice" as the traditional version, but it is a whole lot more fun! Christmas can be a lot of fun for cats, what with trees to climb, and baubles to swat at. This cat has been there, done that, long before Christmas Eve rolled around. Luckily, just as boredom threatens to take over, a sleigh pulled by 16 white mice lands on the roof. From the fun antics of the cat to the delightful names of the mice (Morsel comes to mind), this is the perfect reading material for the cat lover's Christmas Eve. There is also a dog version of this story. Summer vacations are fun, but they can also be a huge production. Did we pack everything? Is there room for the dog? Why are we taking the kitchen sink? 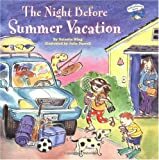 A fun romp with a family that is trying to get ready to go on a summer vacation trip, and all the mishaps that come with packing for fun in the sun. Books and children are my life, so it comes as no surprise I am a collector and admirer of children's books. Someday, I may attempt to write one myself.